In his race photos, Josh Cassidy is an intimidating, even fierce presence. His right bicep features his own tattoo design, a detailed lion atop a set of Olympic rings. His other arm sports a Celtic cross illustration with his last name above. But in person, the first things you notice are his friendly blue eyes, his warm smile and easy laugh. Three years ago he reached the top of his world, something he’d been striving towards for a dozen years: he won the men’s wheelchair division at the 2012 Boston Marathon. But Cassidy soon learned that life at the top is fickle, with victory measured in centimetres, or seconds. He didn’t fare nearly so well at the London 2012 Paralympics five months later, finishing 12th in the marathon and 5th in the 800 metres, all the while suffering from a viral infection. But he bounced back four weeks later, winning the Chicago marathon, another world-class event. The most difficult part of racing, Cassidy explains, is to show up on the start line and not feel the pressure of expectations or performance. “In my biggest wins, like Boston, I had a calm confidence and I was detached from any negative expectations,” he says. There was a mountain of expectations on him this summer as he raced three track events at the Parapan Am Games in Toronto. His photo was on city billboards, and he was widely predicted to bring home a gold medal, or three. But his first race, the 5000 metres, was run in horrible, rainy conditions that slowed him down and favoured smaller, lighter athletes. He lost by 4/100ths of a second to a rookie. He left the Games with three silver medals in the 800, 1500 and 5000 metres – not a bad haul, but short of his goal, which was to win gold in one or more of his events, especially in front of his home crowd. By process, Cassidy is referring to his determination to be the best in the world, which means fine-tuning his body, emotions, equipment, tactics, and especially his mind. “After 15 years of doing this, I’m still trying to attain my best,” he says. Cassidy was born in Ottawa 31 years ago, the first of 10 children in his family. At three weeks of age, the doctors thought he had spina bifida, but they eventually diagnosed neuroblastoma, a cancer of the spine and stomach. His life hung in the balance. His cancer was eventually defeated after five years of treatment and surgery but his legs were left partially paralyzed. However, he always loved activity and sports. He played road hockey with his brothers in Port Elgin, where he grew up. He played goal because he was well-suited to the butterfly style. His hero was NHL netminder Patrick Roy, and he has a tattoo on one of his legs that says “Be A Warrior”, a reference to Roy’s own motto. When Cassidy was 15 he met a national parasport coach by chance in a Port Elgin restaurant who helped him get his first racing wheelchair and encouraged him to race. A year later Cassidy watched Canadian para-athlete Jeff Adams win two gold medals, a silver and a bronze on the track at the Sydney Paralympics, and his desire to race with the best was born. He made his first national team in 2006, and represented Canada at the Beijing Paralympics in 2008 as a 23-year-old. Competing in front of 90,000 spectators confirmed his love of high-level competition, even if he didn’t medal. He left the games determined to get stronger, and faster. The following year he kept his original track coach Amanda Fader of Ottawa but added a new member to his team, strength trainer Wayne Burke, who operates Shift Fitness in the south end of Guelph. Cassidy began commuting to the city a couple of times a week from Oakville for workouts with Burke. The new regime immediately paid off. In the spring of 2010 Cassidy won the London Marathon, the first of his three major marathon wins over the next two years. 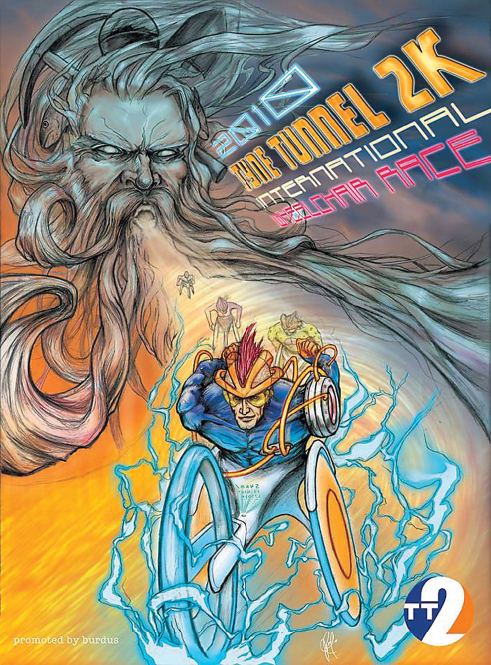 Josh illustrated this poster advertising the 2010 Tyne Tunnel 2K race. Besides training and competing almost full-time, he was also attending Sheridan College in Oakville, studying illustration and design, which had always been a passion. He graduated in 2009 and sent his portfolio to Marvel Comics, who sent him some test scripts to illustrate, to gauge his suitability as a comic book artist. He says that drawing comics would be his “Olympic dream job”, but his success as a wheelchair racer, and the upcoming push to race at the “real” Olympics in London 2012 forced him to put his artistic career on hold. Cassidy went to Boston in 2012 as a known racer but not a favourite to win. He was up against a competitive field that included Ernst Van Dyke, the legendary South African athlete who had already won the event nine times and was looking for a 10th victory. The two of them have similar builds and styles – very muscular in the upper body. Cassidy is heavy for a wheelchair racer at 146 pounds; because of his small legs much of that weight is in his upper body. He and Van Dyke are power racers, especially in sprints and on hills, as opposed to the much lighter, amputee athletes, some weighing under 100 pounds, who float along with far less wheel and wind resistance. Cassidy and Van Dyke charged to the front of the race early on, and Cassidy wanted the South African’s support to stay ahead of the pack that was chasing them down. But the older racer encouraged him to take the lead on his own, which he did at 5K, and he never looked back. He thought Van Dyke might catch him in the late-race hills, because the veteran is a strong climber. But when Cassidy crested Heartbreak Hill alone with about nine kilometres to go, he was certain he could win. He switched his chair’s computer from speed to time, and pushed as hard he could for the remaining 15-plus minutes. He notes that he’s actually been in better condition since Boston, but success depends on many factors, and the margins of difference at the elite level of the sport are very slim. Cassidy cemented his Guelph connection this past year, moving into Riverhouse, the new condominium that recently opened at the corner of Macdonnell and Woolwich Streets. He shares a southeast-facing suite on the 10th floor of the building with his girlfriend Jen Hogue. Their view is stunning, out towards the Eramosa River and the hills around Arkell, where Cassidy spends countless hours training. His apartment doesn’t yet look fully lived in, but the spare bedroom is full of paintings, drawings, an electric piano – the stuff of an artist, not a jock. He says this is his future, once he’s no longer competing at the elite levels of sport. In fact, he recently won a small stunt role in Suicide Squad, a DC Comics summer 2016 blockbuster that was shot in Toronto this past summer. He can’t divulge what that involved, but acting is perhaps another possible avenue for him, post-race career. So is motivational speaking. He’s already spoken several times about overcoming barriers, and has an engagement planned for March 31 at The River Run Centre, where he will discuss moving past failure to achieve success. In the meantime, every bit of his time and energy is focussed on finessing his training to peak for next summer’s Paralympics, in Rio de Janeiro, a hot environment, much to his liking. It’s where he wants to make his mark, like his childhood hero Jeff Adams, with a world championship win in in one or more of his distances. He now has a team of therapists, strength trainers, psychological coaches and nutrition experts around him. Most of his road training – tens of thousands of kilometres of miles per year – has been solo. However, earlier this year he had a chance meeting with Ken Pedersen, a national level bike racer in the 1980s who now works as a software developer in Guelph. The two had an immediate connection, and Pedersen, who recently saw his best friend suffer paralysis of his lower body, offered to train with Cassidy. So for the past six months they’ve been hitting the road together. It might seem an unlikely pairing, but Pedersen says there’s much in common between the two sports: the quest for aerodynamic efficiency, the acute attention to a racing machine, and the tactics of drafting and breaking away. He’s showing Cassidy how to manage his rhythm and pace on hills, and he leads him on accelerations, micro sprints in the middle of a workout, like a surge in a race that’s designed to drop competitors. Late last fall when I met him, Cassidy was recovering from his year of racing, but he’s back training now and plans to start racing again in January, in Australia. His first real test will be the Boston marathon next April, a race he now adores (“I’ll do it until the day I die”). Then come the Canadian championships where’s he’s confident he will qualify for the Rio Paralympics, which are next September. “From an early age, my life has been about overcoming obstacles,” he says. “I truly believe there’s nothing I can’t do if I have the belief and I put in the time.” It’s an attitude he is now focussing on athletics, but which he will certainly apply in a future career (comic book artist? actor? motivational speaker? ), when he’s no longer pushing a tiny, racing wheelchair at speeds of up to 40 kilometres per hour. This story first appeared in the January 2016 issue of Guelph Life magazine, published by the Guelph Mercury. For the magazine version see here.